Out of all the neckties that I have, I cannot get any but gold neckties to work with my charcoal suit to my satisfaction. 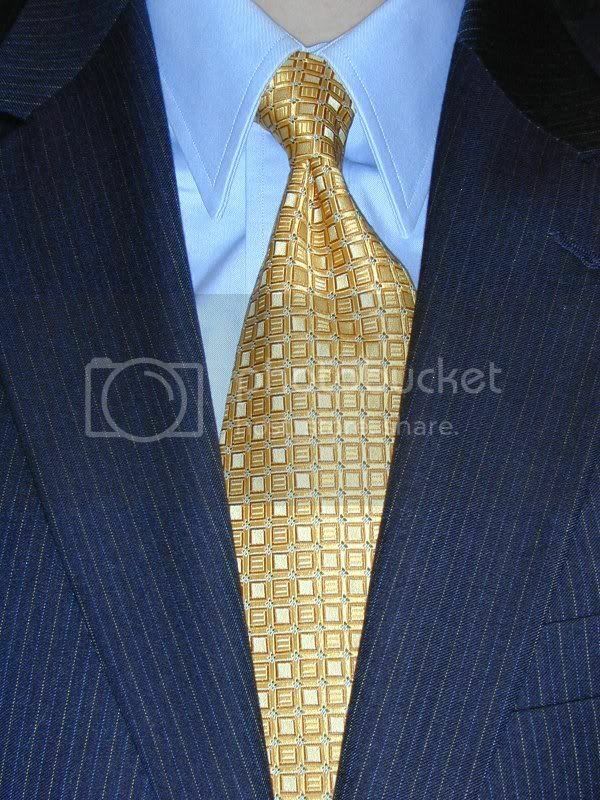 The suit has a gold and a blue pinstripe. One would think that I would be able to find a blue tie that would work. So far that is not the case. Yesterday (Sunday) I mixed it up a bit and wore a regular blue shirt instead of a french blue. Oooo Ahhhhh! I did manage to wear a different, but still gold, necktie. I guess I'm going to have to actually go out and shop for a tie that will work. I've been meaning to look for another tie to conglomerate with the shirt I wore a few weeks back. Wish me luck. I'm going to need it. Ohh! That tie would definitely look good on my husband. He loves that color, and it reflects his jolly nature! I’m giving this to him on his birthday.